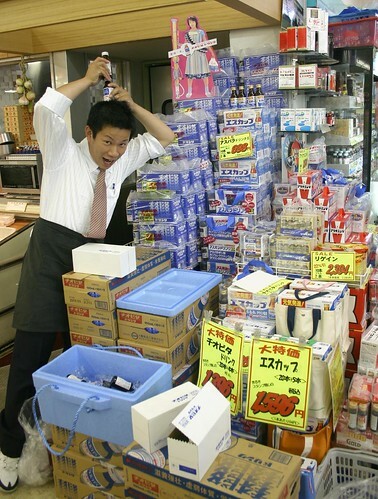 At a store selling heath potions, the salesman does a samurai pose (the bottles are meant to be the samurai's hairstyle) for the camera. The Japanese are very keen on these medicines. They are advertised extensively on television and stocked at all chemists and many convenience stores. They contain various minerals and vitamins, extracts such as "royal jelly," and importantly caffeine and nicotine in fairly large quantities. Their effect is largely thus comparable to having two cups of espresso coffee and a cigar. The adverts suggest that drinking these potions makes you "genki hatsu ratsu" (particularly fit in mind and body), keep fighting for one more try, or take off in a personal rocket backpack. 1) The tradition of imbibing east Asian medicines (Kanpou Yaku) which makes extensive use of various plant and animal extracts and minerals. This tradition continues not only in the health potions featured above but also a general tendency to believe that alcohol, black vinegar, green tea, "green juice" (ao-jiru) vegetable extract, and extracts of certain types of mushrooms have medicinal properties. 2) The Japanese salaried employee is often so busy that he or she has need of drugs such as this to get him (or her) through the day. When I working in a Japanese company employees would bring a case of health potion to the office for everyone to drink. 3) Japan has a culture of linguistic humility where it is considered in bad taste to tell people how much work one is doing. One has to be oblique. But visual signs of endeavour are acceptable, so drinking a health potion at ones desk is a way of telling colleagues that one is trying very hard. Visual expression of "genkiness" and positivity in general are quite acceptable, as can be seen from the photograph above. 5) As found in Catholic cultures where believers eat the body of God on Sunday, the Japanese have a tradition of consuming food - particularly rice cakes - which is believe to be imbued with the spirit of their deity. The rice cakes consumed at New Year are traditionally believe to have this spiritually invigorating function. (It is also notable that members of Catholic cultures in Europe also seem to be fond of potions too. The French are fond of medicinal teas and the consumption of espresso coffee in both France and Italy seems to have a ritual quality).